Experimenting with electricity is a most fascinating and instructive pastime. 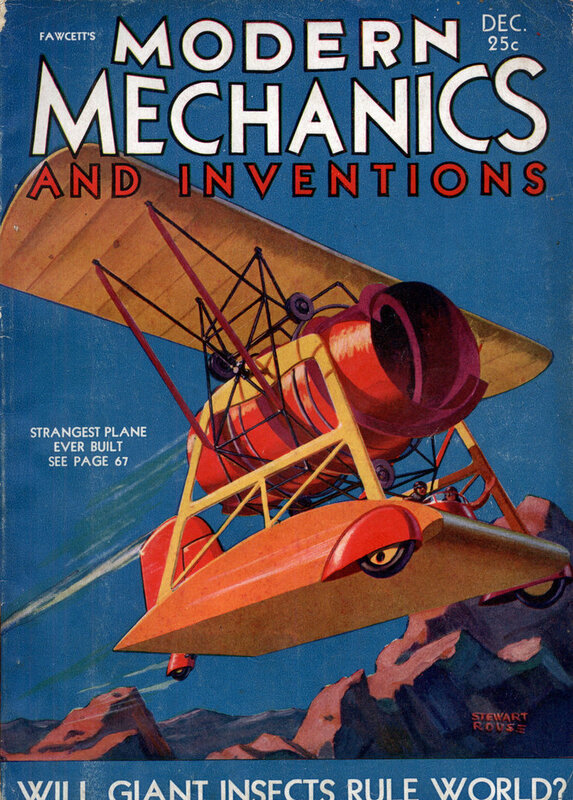 This month, Modern Mechanics and Inventions presents to its readers plans for making apparatus with which both the practical and theoretical side of electricity can be studied. Editors of this department always stand ready to assist readers in any way possible. 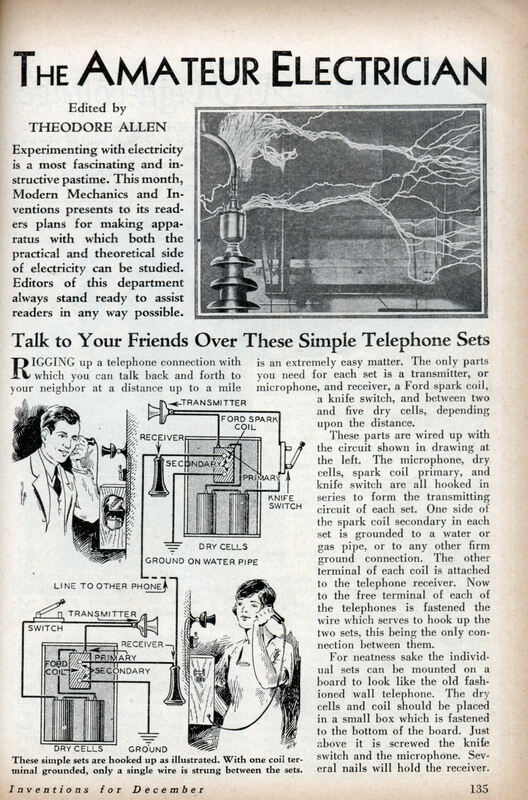 RIGGING up a telephone connection with which you can talk back and forth to your neighbor at a distance up to a mile is an extremely easy matter. The only parts you need for each set is a transmitter, or microphone, and receiver, a Ford spark coil, a knife switch, and between two and five dry cells, depending upon the distance. These parts are wired up with the circuit shown in drawing at the left. The microphone, dry cells, spark coil primary, and knife switch are all hooked in series to form the transmitting circuit of each set. One side of the spark coil secondary in each set is grounded to a water or gas pipe, or to any other firm ground connection. The other terminal of each coil is attached to the telephone receiver. Now to the free terminal of each of the telephones is fastened the wire which serves to hook up the two sets, this being the only connection between them. For neatness sake the individual sets can be mounted on a board to look like the old fashioned wall telephone. The dry cells and coil should be placed in a small box which is fastened to the bottom of the board. Just above it is screwed the knife switch and the microphone. Several nails will hold the receiver. Curious circuit. At first I thought that “Ford spark coil” meant the whole buzzing high-voltage device used by a Model T, which would produce a terrible racket. Apparently not. I now think they mean just the coil, and they’re using it as an audio-frequency transformer. Any insights, anyone? The coil is used to match the low impedance of the transmitter to the higher impedance of the line. The coil has 2 purposes, 1 as an impedance transformer, low ohms at tramsitter, high at receiver. 2: What probably was on the next page or number was how to make a call signal. Making the buzzer work with an high note, the receivers will howl. This solution has been used by e.g. british armed forces, and on some old telephonesystems. It works well, but you may imagine how it is if somone send that sound ino your ear when having the receiver into your ear.